All in all I consider myself a pretty lenient person. Especially when I talk about chocolate, I tend to look for the best in every bar a chocolate makers creates. But there are times I become so disappointed. Sadly, last monday was such a day. 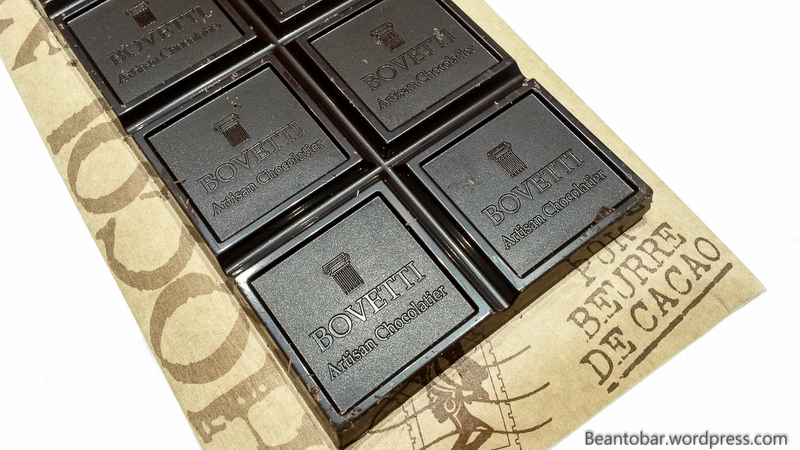 While going on a 7 hour road trip to Lyon, France – my boss who traveled with me – noticed a display of French Bovetti bars in a shop. As he knows I’m into good chocolate he convinced me to buy a bar to see if it is any good. He got himself a 38% milk bar. We both looked forward to a little moment of chocolate delight, while turning back to the highway. But just after the first bite we looked at each other and asked ourselves: where is the taste? I have to admit the bar is looking great. The bar stands out from generic chocolate packages. It even states an origin and the chocolate itself shines beautifully, while an embossed logo on the pieces gives it a certain luxurious look. 73% can be such a wonderful percentage and while I noticed Ecuador, Ghana and Papua New Guinea I still thought it could be tasty. After all, Soma chocolate already showed me a blended bar can be a delightful aromatic experience. But then comes the aroma and taste… or rather, the lack of it. I was godsmacked that such a pristine looking bar – sold at about € 5 – could be so… bland. There is no other word for it. I expected roasted aroma’s, maybe some fruity vibrations, smoky cacao…. but nothing. Even the deep chocolate, hard roasted flavor of dark bulk chocolate is missing. Abundant cacao butter makes for easy melting but tasteless bar. 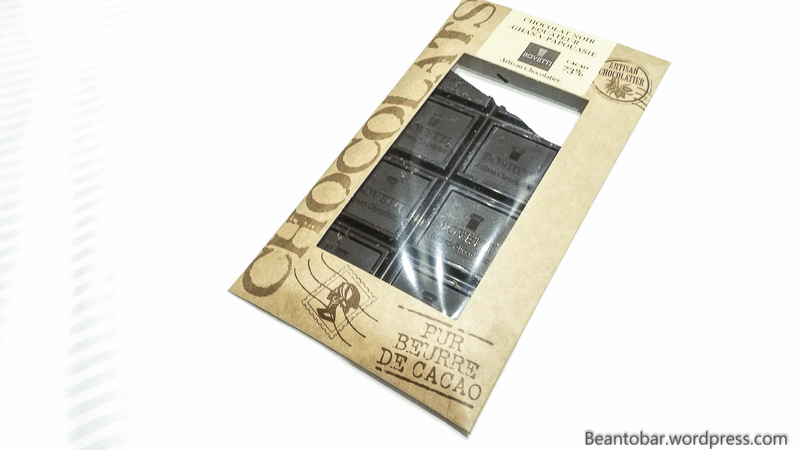 The “Pur beurre de cacao – pure cacao butter” imprint on the package could be considered a warning. And it makes me sad. Because I wished it would have been good. The 38% milk chocolate was even worse. The only thing I could compare it to is a “chocolate” bar know as Koetjesreep in Holland and Belgium. Basically it’s not a chocolate as it has less than 35% cacao in it and lots of other ingredients. And this high-end looking bar tasted just the same. Sad really. Simply because I was so shocked by the actual taste, I decided to write about it. So you will forgive me the photo quality – shots taken with my smart phone in a hotel room under artificial light. This is a prime example of an industrial bulk product repacked in a fancy wrapper to make it better than it really is and it stands as far away from real chocolate as it possibly can. Maybe in the end I should be glad I tried it. Because now I have a renewed respect for real artisan chocolate makers, who create wonderful chocolate oozing with exciting flavors. Just the thing that makes my heart skip a beat. Love the packaging & the look! Sad it should be such a letdown. It’s the same with some pastry chefs, they focus more on a flashy-fancy presentation rather than good taste.